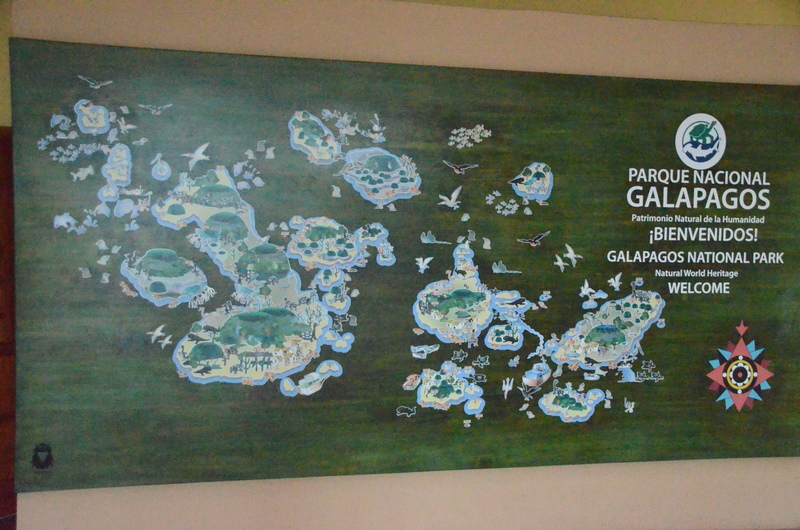 The sign at the Galapagos National Park Interpretive Center giving an overview of the park. First, the requisite regional overview. There are 13 main islands in the 61 island and islet chain. The total geographical area covers 28,000 square miles (45,000 sq. km.). The actual land area is about 4897 square miles or slightly smaller than the US State of Connecticut. The area is ever-changing, both topside and under the ocean. Three major ocean currents, Humboldt, Panama and Cromwell, influence the weather and the ecosystems. 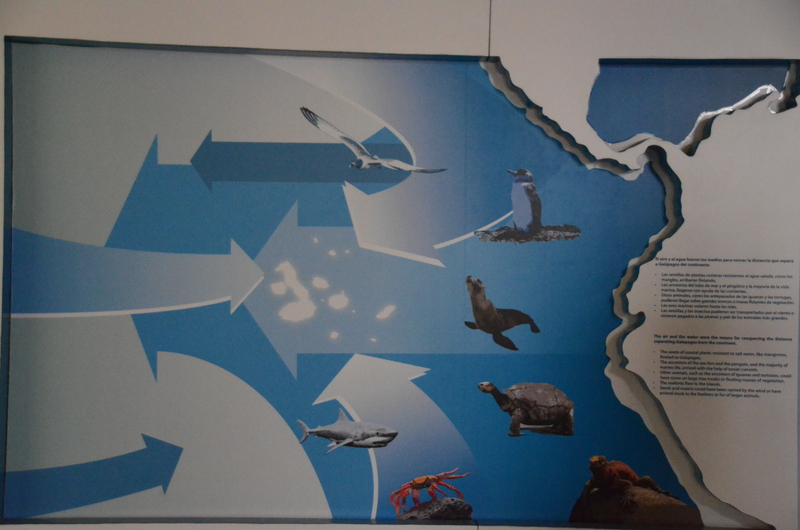 A sign explaining how the ocean and wind currents enabled animals to arrive on the islands. We visited during the wet season when the warmer Panama current rules. Blue skies prevailed and any rain quickly moved across the porous volcanic rocks and was gone for another day. 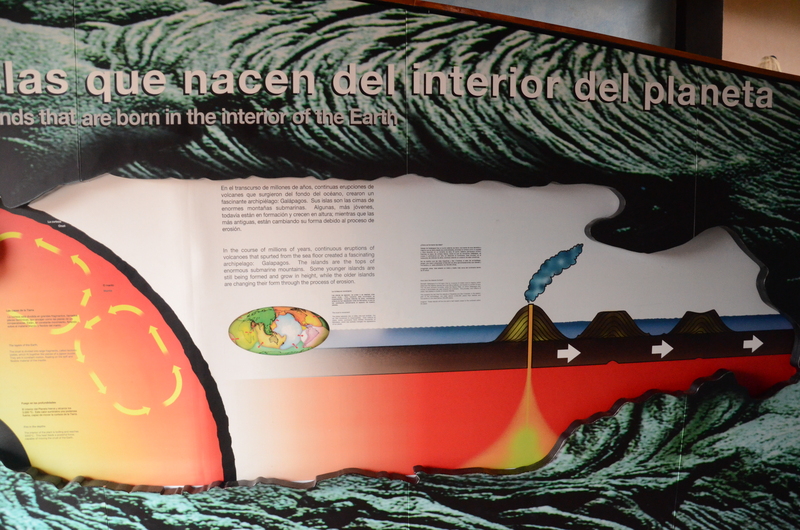 An interpretive center sign explaining volcanic activity. Each island shifts from the volcanic hot spot and new islands are formed. An excellent example of the process can be found on Santiago Island. This place really rocks! Santiago’s Sullivan Bay is roughly in the middle of the island group. 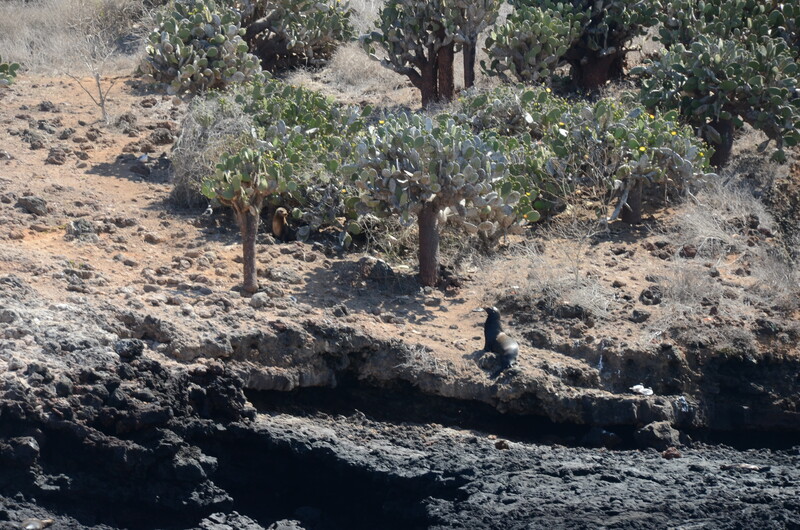 In this place with a hot volcanic history, animals and plants are uniquely adapted. 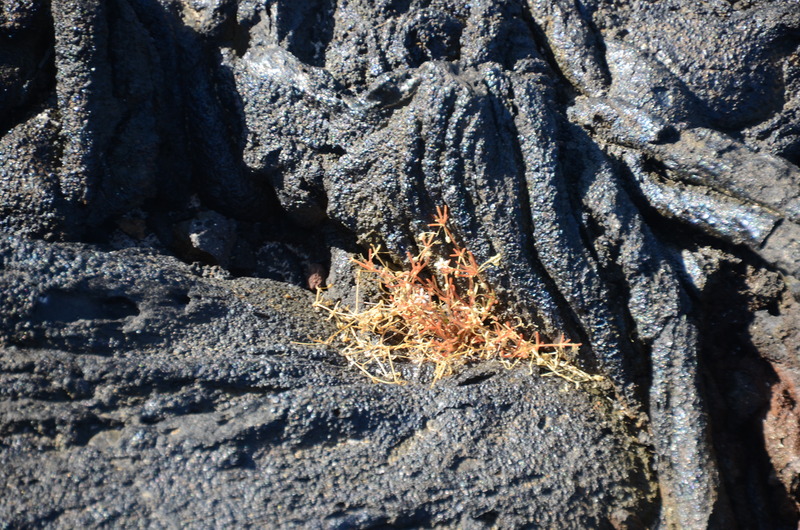 A good part of the island is covered with Pahoehoe Lava. The surface is smooth and ropelike, with some green, beige and pinkish red flecks. The latter denotes iron. The last major volcanic activity was over 100 years ago. Our guide upside-down on the lava field. Our ship, the MV San Jose, in in the top center of the photo. Splatterpot formed as a vent hole while lava was cooling. Break time on the lava field. Our guide (with the white hat, blue backpack, and bare feet) discusses rope lava development with our gang from the ship. A view of the lava field containing a variety of Pahoehoe (also called rope) lava designs. 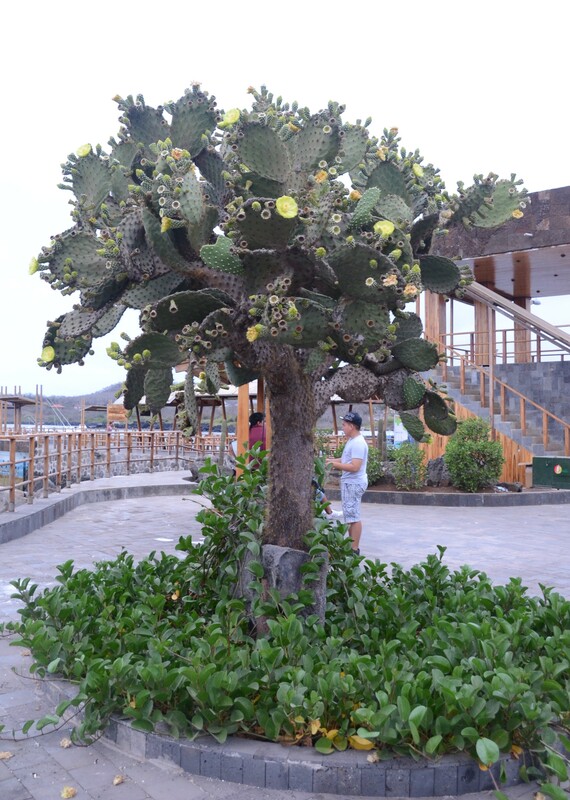 Three main varieties of Cactaceae live on this island chain here in the Pacific Ocean. Lava Cactus grow on Santiago Island in the crevices of the lava formations and were one of the first plants to colonize the lava field. They can reach a height of 23 inches. 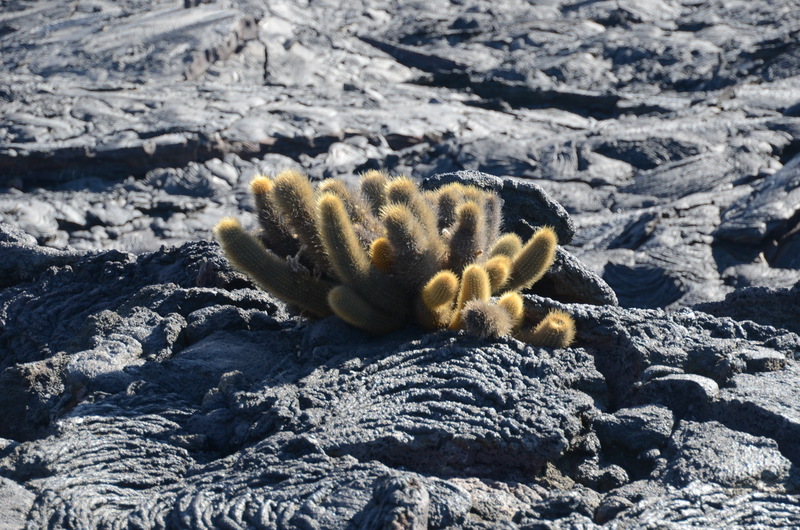 Lava cactus growing in the lava field. It is probably about 4 inches tall and 6 to 7 inches wide. 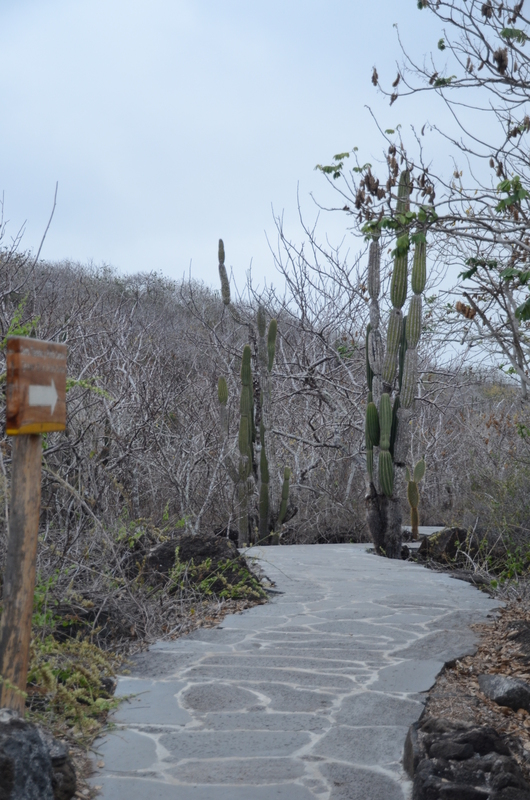 Candelabra Cactus are also endemic to the Galápagos Islands, including Santa Cruz Island, and grow up to 23 feet. 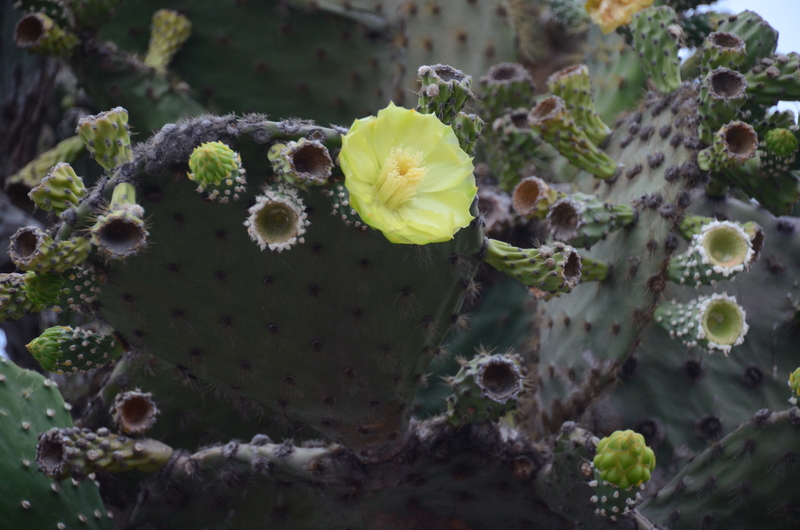 Prickly Pear or Opuntia are the most common cacti in the Islands. They can grow up to 5 feet tall. 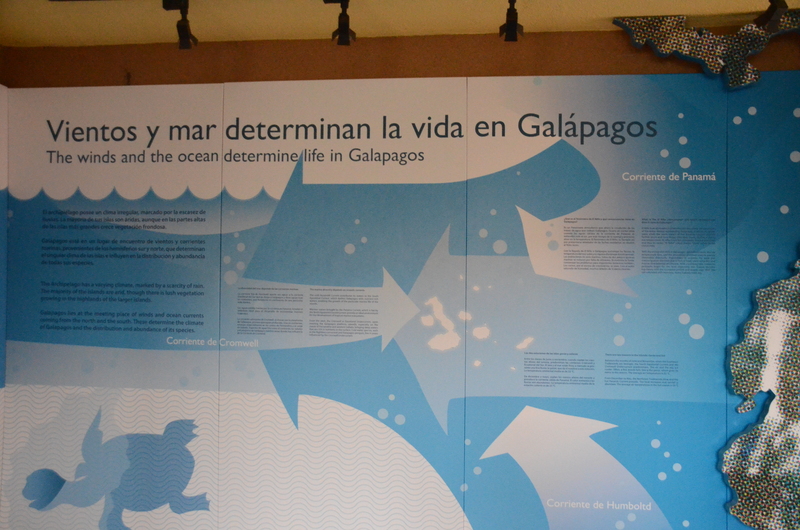 Overall, the Galápagos are home to more than 600 species of plants and almost one-third of them are endemic, meaning that some species cannot be found anywhere else on Earth.